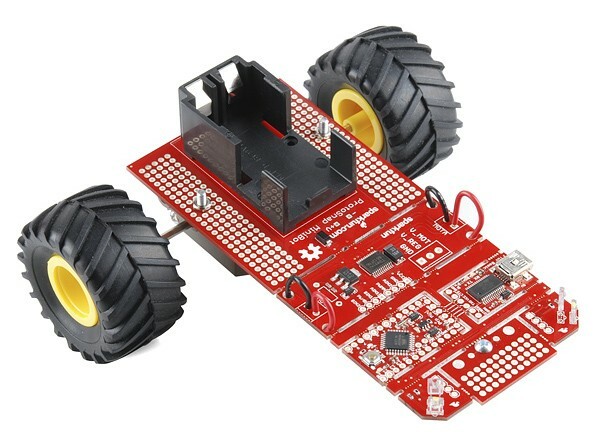 SparkFun struck a chord with many when it released the ProtoSnap series last year. The perforated perfboard housed not only a tiny Arduino compatible chip, but a small host of sensors and components that made assembling simple projects a snap (pun not only intended, but relished). Tomorrow, the company will begin selling the next member of its ProtSnap family -- the MiniBot. Just like its predecessors, the ProtoSnap MiniBot is based around an Arduino compatible microcontroller (specifically ATmega328) and features a number of components that can easily be detached when you're ready to move from prototype to a more permanent arrangement. The onboard selection components is fairly limited. The base is a relatively bare perfboard with a 9v battery holder on one side and two wheels connected to a motor on the other. Up front is two IR sensors that can be used for basic controls. Of course, it's simple enough to expand on the basic platform with any host of sensors and components, like servos or RF receivers. Ultimately it's up to your imagination and skill level, which is why SparkFun is primarily targeting the kits at the educational market. The company's new educational outreach program is making a big push to put the ProtoSnap MiniBot in classrooms across the country, starting with high schools and trade schools, as a bridge from more simplistic robotics kits to the more advanced projects tackled at the university level. The completely open source robotics platform will be available tomorrow for $74.95. As soon as we can get our mitts on one our own we'll return with a thorough hands on... one that reveals just how much smarter the average high school kid is than us.